Take a look below for a model of what is happening on an atomic level. ✍️ Looking at the change in charges, which species is gaining electrons and which species is losing electrons? ✍️ Define the terms oxidising agent and reducing agent. Identify which is which in the above reaction. To work out which species is being oxidised and which is being reduced, it is possible to assign oxidation numbers. Below is a short summary of the rules for assigning oxidation numbers. Alternatively, click here. You can use oxidation number to decide which species is oxidised and which species is reduced in a reaction. ✍️ Try question numbers 1-14 on the worksheet found here. Answers are at the bottom of the link. One of the properties of transition metals, is that they can have variable oxidation states. For example find the oxidation numbers for the metal in the following pairs of compounds. ✍️ Write the IUPAC names of the two iron oxide compounds above. Table 25 of the Data Booklet ranks the metals in order of increasing activity. This ranking has the most reactive metals at the top and the least at the bottom. A metal higher on this list will displace a metal lower on the list from solution. For example, Zn is above Cu. As we saw in class, the zinc metal displaced the copper metal from solution. This is because zinc is more reactive than copper and therefore more easily oxidised. Take a look at the rules for balancing half equations in neutral and acidic conditions. (You can also balance half equations in basic conditions but this isn’t covered in our course). ✍️ After studying these rules, try questions 15 and 16 from the worksheet found here. In our next lesson, we will carry out a redox titration. In order to practice the calculation and to understand the process, try a few of the problems found at the link below. Working is given for you if you get stuck but try to do the problems before looking through the answers! As an application of redox, the Winkler Method is used to measure biological oxygen demand (BOD) in order to test water quality. We will do this experiment in class later next week. Why do we need to know this? Eutrophication is a problem that has been caused by the misuse of fertilizers. ✍️ Watch the video below and construct a sequencing brainframe™ to explain the process. Testing the dissolved oxygen concentration in the water sample. Leaving the water sample in the dark for 5 days at a particular temperature. Retesting the dissolved oxygen content. Finding the difference between the two values obtained above. The bigger the difference, the more polluted the water is. ✍️ What is the mole ratio of O2 : S2O32-? Watch the slide show to see the different steps and colour changes occurring when you use the Winkler method to determine oxygen concentration. Try to identify which equation is happening when and what species the colours are due to! ✍️ Read chapter 9.1 of your text book. Use this and any other sources to add anything important to your notes to make a complete summary of this section. An electrochemical cell or voltaic cell can be created to generate electricity. This is how batteries work. Above is a simplified diagram of the Daniel Cell which is formed using two half cells – copper and zinc. The rules for this type of shorthand is to always put the anode before the cathode and to separate the two solutions by the salt bridge (⎮⎮). Watch the video on the electrolysis of molten lead bromide. This was the demonstration you saw in class. Make sure you understand what is happening at the anode and the cathode. ✍️ Predict the products when you electrolyse the following molten salts. State what you get at the anode and the cathode. ✍️ Draw a diagram for the electrolysis of zinc chloride. Include the cathode and anode, the direction of electron flow and the half equations that occur at each electrode. Use the example given in class as a guide. When you have a molten salt, there is only one possible half reaction able to occur at each electrode. Once you add water by electrolysing a solution of that salt, you add another species. Water can be oxidised and/or reduced. You can find these 1/2 equations in your data booklet. The equation with most positive E⦵ is reduced/oxidised in preference. 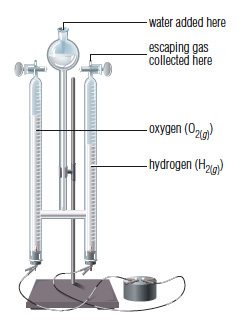 Below is the apparatus that can be used to demonstrate the hydrolysis of water. Dilute acid or sodium hydroxide is used instead of pure water. Why? 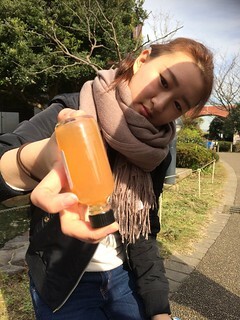 The demo is done with dilute sodium hydroxide solution. Write a list of all the species present in the solution. What are the possible reactions at the cathode? What are the possible reactions at the anode?Watch the video of the electrolysis of water using a dilute sodium hydroxide solution. After observing the demonstration, determine which reaction was taking place at each electrode. Write the overall reaction for the electrolysis of water. Write a summary in your notes in your own words about the electrolysis of water. Consider the electrolysis of a dilute solution of sodium chloride using graphite electrodes. ✍️ What species are present in solution? ✍️ What possible reactions can occur at the a) anode and b) cathode? Make a prediction of which reaction you think is most likely to occur. 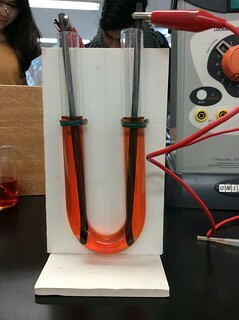 A dilute solution of sodium chloride with 5 mL of universal indicator was electrolysed for a few seconds. Below is the before and after pictures of the apparatus. ✍️ From your observations, what products were formed at the anode and cathode? ✍️ What would happen if a concentrated solution of sodium chloride was electrolysed instead? 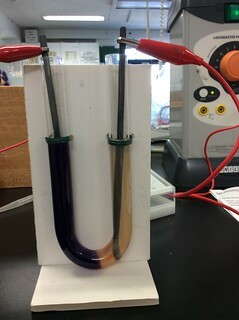 Consider the electrolysis of a dilute copper sulfate solution with a) inert graphite electrodes and b) copper electrodes. ✍️ For the two situations, predict what the products would be at both the anode and the cathode. Remember that if you are using a reactive metal like copper as the electrode, then that can also participate in the electrolysis. From this equation, if we know how many moles of electrons we have used in the circuit, then we can find how many moles of copper metal and therefore what mass of metal was deposited. Step one, is to use the following equation to work out how much charge was supplied in the circuit. Step two, is to work out how many moles of electrons have that much charge. There is a constant in your data booklet called the Faraday’s Constant (F). It is the amount of charge carried by 1 mole of electrons and the value is 9.65 x 104 C mol-1. F = Faraday’s constant measured in Coulombs per mole (C mol-1) and found in your data booklet. Step three, uses the mole ratio from the half equation above to determine the number of moles of copper deposited. Step four, converts moles to mass! Work through the problems found here. Your answers may be a little different from those supplied as they use a slightly different value for Faraday’s constant and molar volume of an ideal gas. You should use the values given by the IB. This entry was posted in 9/19 Oxidation and Reduction and tagged redox on December 1, 2016 by Merilyn Winslade. This video has a summary of oxidation numbers and redox reactions. This entry was posted in 9/19 Oxidation and Reduction and tagged balancing redox reactions, ibchem, oxidation numbers, redox, topic9 on November 25, 2014 by Merilyn Winslade. To see where this came from, click here. This entry was posted in 9/19 Oxidation and Reduction and tagged ibchem, oxidation numbers, redox, topic9 on November 25, 2014 by Merilyn Winslade. This entry was posted in 9/19 Oxidation and Reduction and tagged flash, ibchem, reactions, redox, topic9 on November 25, 2014 by Merilyn Winslade.